“Going forward, we will not blindly stay the course,” President Obama said in unveiling his new Afghanistan strategy this spring. “Instead, we will set clear metrics to measure progress.” Unfortunately, finding useful metrics for assessing counterinsurgencies is not easy. Getting the force size right is key to a successful counterinsurgency, but there is no exact formula — even when you get the numbers right the troops may fail because of poor training, difficult terrain or shifting politics. So how to best measure actual progress? The civilian fatality rate is clearly important — yet it is often a lagging indicator of changes in momentum. As important as reducing violence, therefore, is improving government institutions and the provision of services. This is hard to measure, but economic and quality of life indicators give some hint. The American troop buildup in Afghanistan is proceeding on schedule, and contact with the enemy and violence have increased accordingly (though civilian fatalities, mercifully, have not increased). Convoys carrying NATO supplies are having fewer problems getting through, but travel for ordinary Afghans has not become easier or safer. 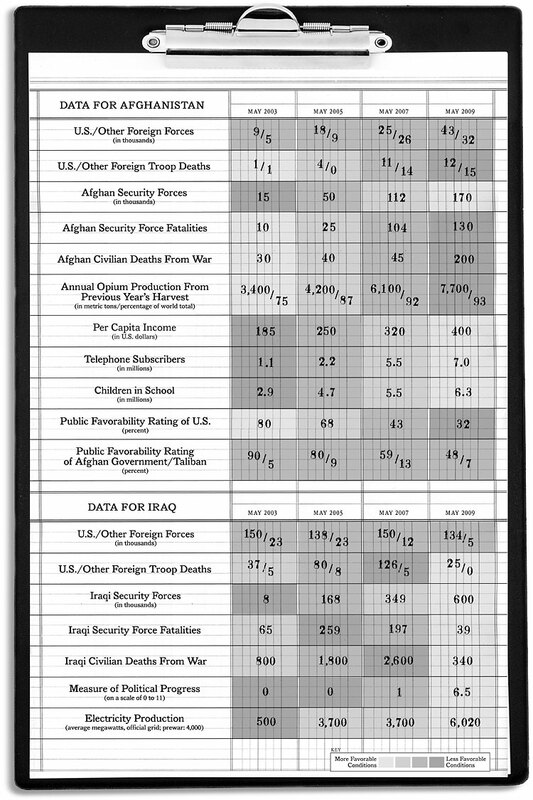 There are other vital indicators that unfortunately the military is not tracking well at present. One is the crime rate. Another is the inflow of fighters across the border — it’s a notoriously difficult thing to measure, but the Pentagon figured out how to do it in Iraq. As for Iraq, despite various horrible attacks, this year has not seen a reversal of previous progress against insurgents. More worrisome is the political scene; the Baghdad government has achieved 6.5 of the 11 “Iraq index” benchmarks we have laid out, which include steps like establishing provincial election laws and enacting amnesty laws. This actually indicates lost ground from a score of 7 in April. On balance, the situation is much improved, but hardly stable, especially since most American troop reductions have yet to occur.